Students in Nigeria who will like to study abroad should read these Post. These Blog is keeping you up to speed with the latest updates about how to study at the University College London. Get to know more about the latest changes with regards to the University College London Tuition Fee, Courses & Admission Requirements. Before we break that down, let’s take a look at the brief history of UCL. University College London (UCL) is a public research university established in 1826. It’s a highly-selective constituent college of the federal University of London. It is the third largest university in the United Kingdom by total student enrollment and the largest by postgraduate enrollment. The University College London had academic Affiliations with institutions such as Alan Turing Institute, ACU, ENTER, European University Association, Francis Crick Institute, G5, Golden triangle, LERU, Russell Group, SES, Thomas Young Centre, UCL Partners, UCLH, University of London, URA and Universities UK. The university’s official Website is at ucl.ac.uk. UCL was the first university institution to be established in London, the first in England to admit students regardless of their religion and the first to admit women. In 1836 UCL became one of the two founding colleges of the University of London, and was granted a royal charter in the same year. The university has grown through mergers with the Institute of Neurology, the Royal Free Hospital Medical School, the Eastman Dental Institute, the School of Slavonic and East European Studies, the School of Pharmacy and the Institute of Education. UCL has its main campus in the Bloomsbury area of central London, with a number of institutes and teaching hospitals in central London and satellite campuses in Queen Elizabeth Olympic Park, Stratford east London and Doha Qatar. the Grant Museum of Zoology, the affiliated University College Hospital, the UCL Cancer Institute, the UCL Faculty of the Built Environment (The Bartlett), the UCL Faculty of Laws, the UCL Institute of Archaeology, the UCL Institute of Education, the UCL School of Pharmacy, the UCL School of Public Policy and the UCL School of Slavonic and East European Studies. The area around Queen Square in Bloomsbury, close to the main campus, is a hub for brain-related research and healthcare, with the UCL Institute of Cognitive Neuroscience and UCL Institute of Neurology along with the affiliated National Hospital for Neurology and Neurosurgery. The UCL Great Ormond Street Institute of Child Health and the affiliated Great Ormond Street Hospital for Children adjacent to the building. The UCL Ear Institute, the UCL Eastman Dental Institute and the affiliated Royal National Throat, Nose and Ear Hospital and Eastman Dental Hospital are located in east Bloomsbury along Gray’s Inn Road forming a hub for research and healthcare in audiology and dentistry respectively. In Central London, the UCL Institute of Ophthalmology (based in Clerkenwell), the Windeyer Institute (based in Fitzrovia), the UCL Institute of Orthopedics and Musculoskeletal Science (based in Stanmore), The Royal Free Hospital and the Whittington Hospital campuses of the UCL Medical School, and a number of other teaching hospitals are located. The UCL School of Management is located at Level 38, One Canada Square in Canary Wharf, London. The Department of Space and Climate Physics (Mullard Space Science Laboratory) is based in Holmbury St Mary, Surrey, and there is a UCL campus in Doha, Qatar specialized in archaeology, conservation and museum studies. 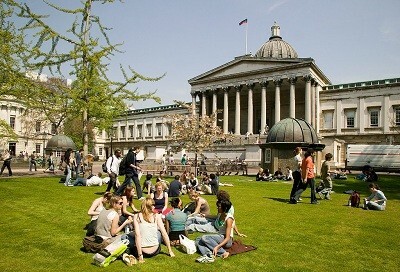 UCL is organised into 11 constituent faculties with over 100 departments and research centres. UCL operates several culturally significant museums and manages numerous artifact collections in a wide range of fields, including the Petrie Museum of Egyptian Archaeology, the Grant Museum of Zoology and Comparative Anatomy. UCL administers the annual Orwell Prize in political writing. According to the recent Research Excellence Framework rankings for research power. UCL is a member of numerous academic organisations, including the Russell Group, UCL Partners, the world’s largest academic health science centre, and the “golden triangle” of research-intensive English universities. UCL has over 840 professors, the largest number of any British university. UCL has made cross-disciplinary research a priority and orientates its research around Global Health, Sustainable Cities, Intercultural Interaction and Human Wellbeing. According to a ranking of universities produced by SCImago Research Group, UCL is ranked 12th in the world and 1st in Europe in terms of total research output. The current UCL Medical School developed from mergers with the medical schools of the Middlesex Hospital and the Royal Free Hospital (formally known as the London School of Medicine for Women). Clinical medicine is primarily taught at the Royal Free Hospital, University College Hospital and the Whittington Hospital, with other associated teaching hospitals including the Eastman Dental Hospital, Great Ormond Street Hospital, Moorfields Eye Hospital, the National Hospital for Neurology and Neurosurgery and the Royal National Throat, Nose and Ear Hospital. UCL is a major centre for biomedical research and is part of three of the 20 biomedical research centres established by the NHS in England – the UCLH/UCL Biomedical Research Centre, the NIHR Biomedical Research Centre at Moorfields Eye Hospital NHS Foundation Trust and UCL Institute of Ophthalmology, and the NIHR Great Ormond Street Biomedical Research Centre. UCL is a founding member of UCL Partners, the largest academic health science centre in Europe and is also a member of the Francis Crick Institute, one of the world’s largest medical research centres, housing 1,250 scientists, and the largest of its kind in Europe. The application process is similar to that for UK/EU students but all international students are advised to read the information and guidelines provided for international applicants. If applicants do not have the required entrance qualifications, they should have alternative qualifications that demonstrate their academic potential and ability to thrive in their chosen subject. Candidates should enquire with the relevant programme contact provided on the degree pages. UCL considers applications to accredit prior learning at other recognized universities. Advanced standing is only awarded at UCL’s discretion. UCL degrees are principally designed to be taken on a full-time basis; all teaching takes place during the daytime. However, some departments do permit part-time study. Please enquire with the relevant programme contact provided on the degree pages. Applications for part-time study are made directly to UCL, not to UCAS. Entry requirements include A level, AS and GCSE qualifications. Academic fees are charged on either a per-course or per-program basis, depending on the Faculty or program in which you enrol, and in most cases include tuition costs as well as supplementary fees. Additional fees may include health plans, (where applicable) and associated course and program fees. Please note that course and program fees are subject to approval by UCL Board of Governors in accordance with the fees guidelines set by the Ministry of Training, Colleges and Universities and are subject to change. Fees are charged at either the domestic or international rate, depending on your fee status. The domestic rate applies to American citizens, permanent residents and certain exempted international students; the international rate applies to most international students. If you are an international student and at some point become a landed immigrant or a American citizen, you will need to advise the Registrarial Services office of your status change.